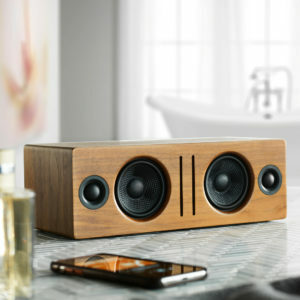 The HD6 Wireless Speakers are Bluetooth speakers with sound that fills any room and connects to any device. No network setup, passwords to enter, or buttons to push. HD6 Wireless Speakers are not just another great-sounding Audioengine speaker but a complete Bluetooth music system that works with all your apps, music, and devices (even your favorite turntable). Blending the best of the past and present, HD6 combines stunning good looks with truly-useful features. It's pretty easy! Our powered speakers are an all-in-one solution with no extra amps or components needed! All you need to do is unpack the speakers, place them where you want, and then plug in the AC cord. Next, connect the included speaker wire from the active speaker to the right passive speaker. Then plug in your music (iPod, CD player, computer, etc.) with the supplied cables and you're ready to go! Even though the HD6 has a built-in Bluetooth receiver, the HD6 are extremely versatile and can be used with a number of different devices, both digital and analog. There two analog inputs, a mini-stereo and RCA input, on the rear panel so you can directly connect any product with a line-level/preamp audio output, such as a turntable. The HD6s also have an optical input that utilizes the speakers' built-in DAC, so any source that has a digital optical output can be used directly with the speakers, such as the optical output of your television or computer. What's the difference between the HD6 and the A5+? You would connect the variable output of the HD6 into the input of your sub using RCA cables. Once your HD6 is paired and connected, then open any app (iTunes, Spotify, Amarra, etc.) - or online players such as Youtube - and it will automatically play your music through Bluetooth once you've selected what you want to hear. The HD6 is not officially supported by any universal remotes. However, you can use a learning remote to copy the signals being sent by the HD6's remote. Check with the manufacturer of your remote to find out if it supports learning IR codes. To replace the battery in your HD Series remote, you'll need a paperclip or similar. Insert the paperclip into the hole on the back of the remote and push. The battery/button assembly of the remote will pop out. Use the paperclip to push the battery out of the battery clip. Note the orientation of the battery when removing it. Slide the new battery into the battery clip. The positive (+) side of the battery should face away from the PCB. The battery/button assembly is held in place with magnets, so once you've replaced the battery, slide it back into place. Can you stream music wirelessly to the HD6 with the Audioengine wireless adapters like you can with the A5+ Classic? Yes! An AC wall outlet near the HD6 is all you need to power the W3 wireless receiver. The HD6 includes a speaker wire with banana plugs on either end, so using them with the speakers should be a simple set up. The binding posts on the back of each speaker would need to be screwed down and the plugs would need to be inserted into the center hole (please refer to the picture for reference). You would need to make sure that each end matches with the color on the corresponding binding post; for example, if you inserted the red banana plug into the red binding post on one speaker, the same would follow suit for the other speaker. Do keep in mind the plugs on the HD6's speaker wires are meant to be snug fitting into the speaker posts (and may even look like they won't fit at all) so you may have to push with a little bit more force to fit them in. I'd like to connect an Apple Airport Express to my HD6 speakers to stream music from my Mac. I also wish to connect the speakers to my Samsung LCD TV. Is it possible to have simultaneous connections to the HD6? 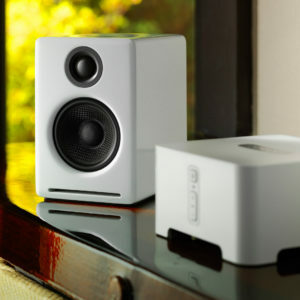 Yes, there are 2 audio inputs on Audioengine powered speakers, so you can connect the Airport Express to one input and the variable output from your TV into the other. Both inputs are "open" or active so you can leave 2 audio sources plugged in at the same time with no need to flip any switches. How does the HD6 handle multiple inputs? Can I use Bluetooth and the optical input at the same time? Both analog inputs are "open" or active, so you can leave 2 audio sources plugged in at the same time with no need to flip any switches! Both the optical input and the bluetooth module share the same DAC so using the optical input on the HD6 as well as streaming to the speakers via bluetooth would utilize the built-in DAC. This means that the HD6's bluetooth receiver takes priority, so if you start playing audio over Bluetooth the optical input will mute; optical will resume automatically a few seconds after Bluetooth is paused or disconnected. What speaker stands work well with the HD6? My computer doesn't have an optical output; how can I connect my computer to the optical input of the HD6? There do exist USB-to-optical converters that should work in a setup like this, though a product like this isn't very widespread. We don't really have any recommendations on a specific brand or model to use, but a quick Google/Amazon search should yield results. Another solution is to use an external DAC, like our D1 24-bit DAC, connected to the USB port on your computer and plug it into either of the analog inputs of your HD6s. What if my source doesn't support aptX? Can I still use HD6 and if so, how will it sound? You can absolutely still use the HD6 and it will sound great! AptX is a high-quality Bluetooth audio codec that works really well. In addition to mandatory support for SBC, Bluetooth also includes optional support for many other codecs, like MPEG-1, MPEG-2, MPEG-4, and AAC, all of which have their own advantages, and some of which sound very close to AptX. If it's on and solid, this means the HD6 is powered on, and currently connected to a Bluetooth-enabled device. If your source is currently sending the HD6 an aptX signal, the LED indicator on the front panel will illuminate orange instead of white. If it's on and blinking, this means the HD6 is powered on but not currently connected to a device. If it's off (and HD6 is powered on), this means Bluetooth is in standby and not connected to a device. The HD6, however, is still visible to your device, so simply connect using your device and the HD6 will automatically wake up. OK, so If I can use the HD6 with TIDAL, how come you're not listed on TIDALs website? Bluetooth has a delay of about 30ms (milliseconds) so you can watch videos from Youtube, for example, and stream the audio through your HD6 without any noticeable lag between the video and audio. When I connect a turntable to my HD6, why is the volume extremely low? Some turntables do not have a built-in preamps and as a result you will need to add an external phono preamp between your turntable and the HD6. Many turntables, however, (such as the Music Hall USB-1 or Audio Technica AT-LP120) have a built-in preamp and include a switch on the back for "line" or “phono”. For Audioengine powered speakers select "line".